I recently wrote a short essay for Public Discourse about the “death with dignity” movement. In the piece, titled “All Death is Death Without Dignity,” I compare the palliative-care movement — which seeks to alleviate the physical pain of death, often in the context of hospice care — to the physician-assisted suicide movement and find the differences in their respective descriptions of death telling. I quote somewhat extensively from the piece here, in order to then offer some additional thoughts on why the phrase “death with dignity” is a problem. It has become common to talk of “death with dignity” in the policy world. There’s a Death with Dignity Act in Oregon, which permits physician-assisted suicide. There’s a Death with Dignity Act in Washington, which also legalizes physician-assisted suicide in certain circumstances. A Death with Dignity National Center exists in Portland, OR, a nonprofit that advocates for patients to “make their own end-of-life decisions, including how they die” — its website is plastered with images of smiling faces. The message, it seems, is that if one can control how one dies or when, the dying process is somehow less disturbing, awful, and humiliating. Instead, it can be dignifying. Conversely, when dealing with end-stage cancer patients and palliative-care physicians in the hospital I rarely hear the “death with dignity” phrase used; more often I hear a palliative-care doctor say, “we want him (or her) to be comfortable.” It is a marked difference between the palliative-care movement and the assisted-suicide movement. In hospice, there is a resignation to the uneasiness and difficulty that comes with any death. With palliation, nurses and doctors can only free the patient from pain but not from the indignity of dying. And why does choosing the way one dies have no relevance to whether or not a death is dignified? Death is not simply a part of life but the end of human life — the end, in some sense, of an entire world. It is the transformation of a living member of our species into an immobile mass of flesh with no potential for life again. Rabbinic Jewish authorities recognized this in the Mishnah, an extensive commentary on Jewish law, when they wrote, “anyone who destroys a life is considered by Scripture to have destroyed an entire world; and anyone who saves a life is as if he saved an entire world.” Thus, not only are the physical manifestations of death ignoble and viscerally disturbing but, in principle, the end of an individual is tragic, too…. Death and dying detract from life by ending it. There are more or less disturbing ways to pass (you can die while someone is breaking your ribs doing CPR or you can die without that), but none of them is truly dignified. And choosing to preempt death using physician-assisted suicide doesn’t change this. In truth, there is no such thing as death with dignity. There is only somber tragedy, as your body lies exposed to the world’s Hobbesian bacteria and insects. I think there is an important debate to be had about whether assisted suicide should be available in certain, very rare circumstances. But that is a separate discussion from the point I am making here, which is that the term “death with dignity” is inaccurate and misleading. The phrase changes our whole concept of death — it is a change that puts a positive spin on dying, a change that detracts from the somber aspects of the end of life. This deceptive use of language reminds me of George Orwell, who focused some of his sharpest criticism on the use of language and how it changes our perception of events and ideas. 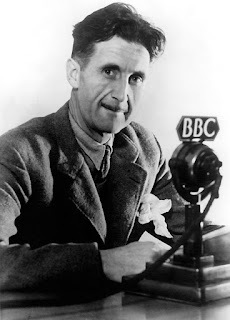 In his famous 1946 essay “Politics and the English Language,” he condemns the “tendency of modern prose ... away from concreteness.” Specifically, Orwell exposes the misuse of euphemisms common in war propaganda — for instance talking about sending people to prison and death camps as the “elimination of unreliable elements.” Euphemisms can obfuscate the gravity and odiousness of an action, thus creating a false appearance so powerful that it can become tolerable, even appealing. In 1984, Orwell offers a similar warning. The totalitarian government of Oceania uses its own language called Newspeak, destroying most of the English language to make way for abbreviations and vague terminology — “cutting the language down to the bone.” As one character explains, “the great wastage is in the verbs and adjectives, but there are hundreds of nouns that can be got rid of as well.” By manipulating the language, the government of Oceania manipulates the way people think, specifically the political and moral decisions they make. One of its most effective tools is the creation of catchy slogans that utterly distort reality: “war is peace,” “ignorance is strength,” and so forth. Indeed, the concept of “death with dignity” is a euphemism for what is one of the most heart-wrenching, difficult, unsettling, and undignified events of human existence. I think of that patient who chose to make his death comfortable and the image is disturbing rather than heartening. Where is the dignity in lying in a bed with flies buzzing around one’s head, vulnerable and lifeless?